You are here: Home / Londontopia Magazine / The First Issue of the Londontopia Print Magazine is Now Shipping – Limited Stock Remains! 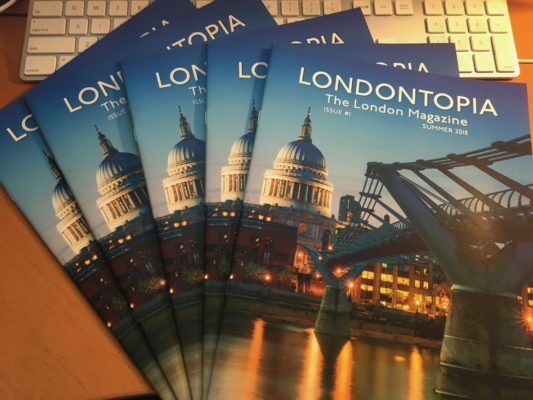 The First Issue of the Londontopia Print Magazine is Now Shipping – Limited Stock Remains! Just wanted to give everyone an update on the Londontopia Print Magazine. We received the issues earlier this week from the printer and shipped them all out to everyone who subscribed in advance. Thank you for your patience and we hope you enjoy the first issue! We have about 90 extra copies of the first issue – so if you fancy getting it – we recommend ordering as soon as possible so you’re not disappointed. An individual issue costs just $12.99 and shipping is free to the USA. A subscription costs $49 to the USA (international shipping rates vary). For the next week, all new subscriptions will start with Issue #1. On August 2nd, we’ll unveil the cover for Issue #2 and then all new subscriptions will start with Issue #2. So, if you want your subscription to start with Issue #1, now is the time to subscribe. You can subscribe or buy a single issue here using our secure subscription system.